Chamomile essential oil is not to be used internally, except under professional supervision. Chamomile is subject to legal restrictions in some countries. The essential oil is also a uterine stimulant so should not be used during pregnancy. It can cause contact dermatitis. Individuals who are allergic to ragweed and its relatives, aster, and chrysanthemums, may react to drinking chamomile tea exhibiting hay-fever like symptoms and hives. Roman Chamomile is native to western Europe and northern Africa, but now cultivated worldwide in temperate regions. It is an aromatic perennial, growing to about twenty inches in height, producing feathery leaves and white,daisy-like flower heads, with yellow centers. The flowers are harvested as they open in summer. The main exporters are Belgium, France, Great Britain, and Italy, followed by Poland, the Czech and Slovakian Republics, North America, and Argentina. German Chamomile is native to Europe and northwest Asia, where it still grows wild. It is cultivated in much of Europe and other temperate regions. The seeds are sown in spring or autumn, and the flower heads picked when in full bloom in summer. It is a sweetly aromatic annual, growing to about two feet, producing finely cut leaves and white, daisy-like flower heads. 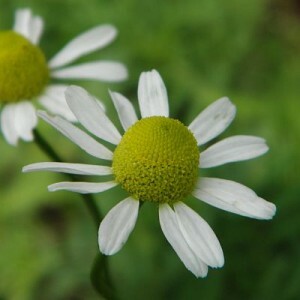 The receptacle of the compound head is hollow, which distinguishes it from other types of chamomile. The German or Hungarian variety is the most widely available for medicinal use, and is biochemically distinct from the Roman or English variety. Although called Roman chamomile, it was not cultivated there until the 16th century and probably arrived via Britain and used as a medicinal plant ever since. German chamomile has been taken for digestive problems since at least the 1st century CE, and is gentle, and suitable, enough for children. The Egyptians dedicated the herb to the sun and worshiped it above all other herbs for its healing properties. Hieroglyphic records also show that chamomile was used cosmetically for at least 2,000 years. Egyptian noblewomen used preparations of crushed petals on their skin. Greek physicians prescribed it for fevers and female disorders. Chamomile is one of the “Nine Sacred Herbs” of the “Lacnunga”, an ancient Anglo-Saxon manuscript. In a popular gardening book of 1638, it was valued for its sweet apple-scented leaves. Frances A. Bardswell’s Herb Garden (1911) states that chamomile has a remarkable effect on other plants and calls it the “plant’s physician”. “Nothing will keep a garden so healthy”, she says, “as plenty of Camomile…It will even revive drooping and sickly plants if placed near them.” The botanical name of Matricaria is derived from the Latin word for womb because of its affinity for women’s conditions. It eases menstrual cramps and pain in childbirth. Doctors in England and the colony of Virginia included it in their medical bags. In modern-day Eastern Europe, particularly Romania, children were sometimes asked to bring the herb to school during government run collection campaigns. Flowers, essential oils Studies have also shown that chamomile may fight against such infectious organisms as Staphylococcus aureus bacteria and Candida albicans fungi which, together with the anti-inflammatory properties, may play a role in wound healing. Chamomile significantly decreases the surface areas of wounds and helped them to dry, especially during eczema outbreaks. The essential oil has shown some activity against gram-positive bacteria and dermatomyces (fungal). Although the tea has some benefit, the essential oil is not very water-soluble, and only a small amount is released into a tea. Therefore, it is important that formulations containing the whole flower head be purchased from reputable sources to help assure the highest potency. Avoid powdered formulas that contain the stems and other parts of the plant. German studies in 1987 showed that a cream made from German chamomile had the ability to heal wounds. Another German study using chamomile and four other herbs showed them to be most effective in easing infantile colic, peptic ulcers, gastrointestinal spasms, and such inflammatory diseases as arthritis. On steam distillation, the proazulenes in the herb produce chamazulene, which is a marked antiallergenic, anti-inflammatory, and antipyretic, relieving symptoms of hay fever and asthma and in treating ulcers. In animal studies, chamomile infusions act as a mild CNS depressant, perhaps explaining the effectiveness as a soothing relaxant. The flowerheads also have several organic anodynes which help to relieve abdominal cramps, a common symptom of PMS. The antioxidant benefits of the flavonoids may also protect the skin from UV radiation. Apigenin may also be responsible for the anti-anxiety and sedative effects. Its action on receptors in the brain is similar to that of such benzodiazepines as Valium, but far less harmful. The anti-inflammatory effects of the flavonoids and the anti-inflammatory and anti-spasmodic benefits of the essential oils may contribute to chamomile’s reputation for easing gastrointestinal inflammation and spasms. Levomenol can improve the texture of the skin by reducing fine lines caused by pollution, stress, and the sun. An infusion is made for irritable bowel syndrome, poor appetite, and indigestion. Putting some in the baby’s bathwater at night encourages sleep. Essential oil has been distilled from fresh flowers since ancient times. It is rare and extremely expensive. It is a deep blue in colour because of the azulenes it contains (azul is Spanish for blue). One home-dried flower has more flavour than a bag of commercial tea. Roman chamomile is used interchangeably with the German. However, it has a more pronounced bitter action that the German counterpart. Chamomile tea is often served in beauty salons to relax facial muscles. The herb is valuable for pain, indigestion, acidity, bloating, nausea, vomiting, colic, and gastritis. It has been used for hiatus hernia, peptic ulcer, Crohn’s disease, and irritable bowel syndrome, as well as for easing menstrual cramps, treating colds and fevers, and hemorrhoids. It is safely taken for headaches and migraines, even by children. It has also been used to stimulate liver function. The herb contains spiroether, a very strong antispasmodic, that relaxes tense, aching muscles, and relieves menstrual pain and irritability, and promotes sleep, especially in children. Today, women who want to lighten their hair without using harsh bleaches often turn to chamomile as a gentler alternative. To lighten blond hair by one or two shades, brew a strong cup of chamomile tea and use it as a final rinse after shampooing, but do not rinse off the tea. Instead, towel dry and then expose the hair to the sun for a few minutes. In rural Mexican communities, an infusion of the plant is sipped during and after labor to ease the pain. An ointment made from the leaves and mixed with onions fried in lard is also used to lessen labor pains. In a survey done in ethnic Mexican communities along a portion of the Texas-Mexico border, chamomile was the most frequently mentioned home remedy. Considered by some to be an herbal aspirin, chamomile has so many widespread uses that it is one of the top ten substances used by mothers in Puerto Rico for treating asthma. Dyer’s chamomile (Anthemis tinctoria) produces golden yellow flowers, which yields a yellow-brown dye used for fabrics. 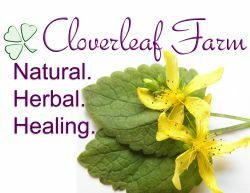 Locate items at Cloverleaf Farm containing Chamomile.